A letter to the Editor we wrote in May last year stirred up a hornets’ nest. We used data from MySchool to compare the VET outcomes from the Tasmanian senior secondary colleges with high schools in other states, claiming that in 2014 the colleges achieved just 54 completions at Certificate ll or above, while 86 students at Rooty Hill High School in Sydney’s western suburbs achieved this goal. Fifty four VET graduates from all of the colleges did look hard to believe, but the importance of MySchool as a source of information for the community made it harder to believe that the number was wrong. Especially as it was consistent with a declining trend in the numbers reported right back to 2010. Surely such a mistake would have been noticed and corrected immediately it was published. But it turns out it was wrong, and the data for the last few years was corrected late last year. For the record, a total of 1,392 VET certificates at level ll or above were completed by college students in 2014, and 1,199 in 2015. We have a double inequality in the outcomes from the Tasmanian public schooling system. First, and as in the rest of the country, students in our more advantaged schools are achieving much better outcomes than students in schools at the other end of the scale. That is the Gonski Gap, the problem Gonski funding is designed to fix. But then we also have inequality between the senior secondary attainment of students in our government system compared with students attending similar schools in other states, regardless of whether they are attending an advantaged or a disadvantaged school. This is the TASki Gap. That is a problem we in Tasmania need to fix. 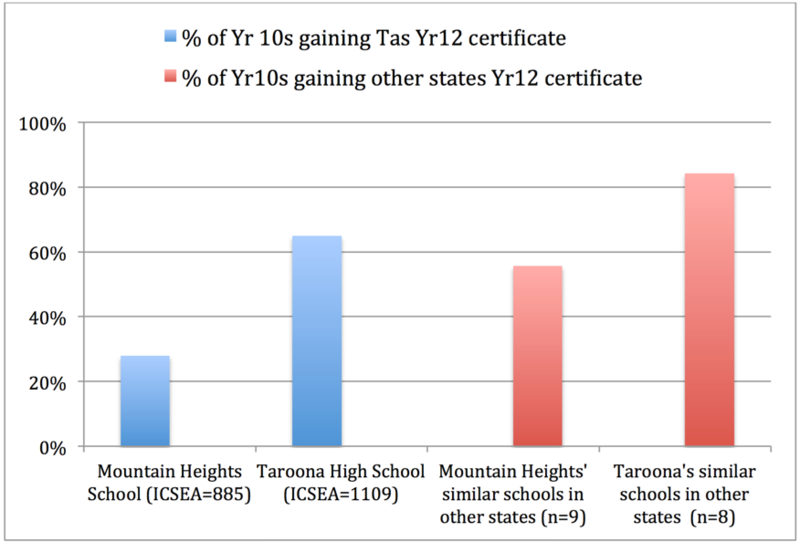 When we first became aware that most Tasmanian young people were not completing their year 12 certificates, the ordinary expectation of students in other states, we wondered whether there might be something wrong with our senior secondary certificate – the Tasmanian Certificate of Education (TCE). Might Tasmania have made its TCE too hard? We’ve all used the old saying ’Pigs might fly’ when some one suggests something might happen and we don’t believe that it can. In some – just a very few, actually – of our discussions with people about Tasmania’s low rate of year 12 completion, and what might be done to improve it, we have got the sense they really wanted to say ‘Pigs might fly’, but were too polite to do so. But we can show – in pictures – that many more Tasmanian high school students are well capable of getting their year 12 certificates than do so now. 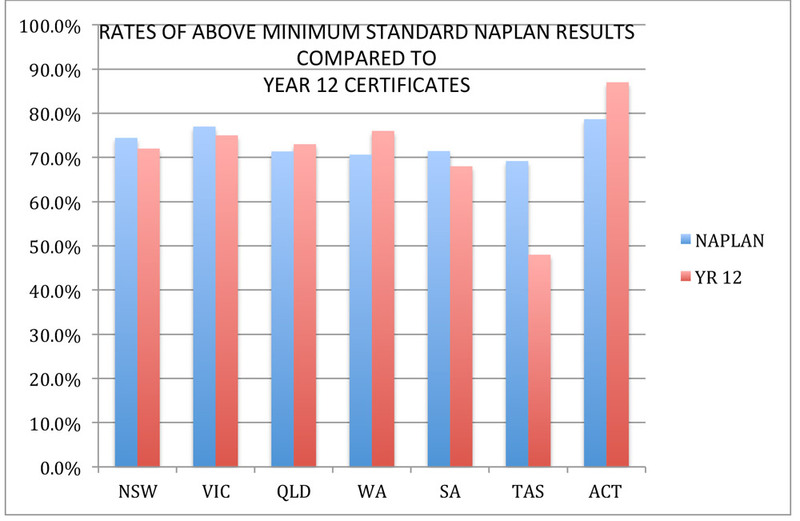 Just look at their year 9 NAPLAN performance, compared to other states, and then at our year 12 completion rate, compared to other states. The others are all close together, while there is a gulf between ours as wide as – but surely not to be explained by – Bass Strait. We need to look at this data, learn what we can from it, and fill that gap as fast as we can. As both the Mayor of Latrobe and MLC for Mersey, I’ve been able to put into practice my firm beliefs that our schools are most successful when they are actively supported by the community, and that one of the most important roles of community leaders is to be powerful champions for our schools. Community based learning is definitely a two way relationship and a strategy of engagement which I am passionate about. The recent news about education in Tasmania has not been all good, with concerns about both young peoples’ and adults’ literacy and numeracy, and the lower proportion of our young people completing year 12 compared to the rest of Australia. But according to Professors Eleanor Ramsay and Michael Rowan, a closer look at the data shows that Tasmania is not so different to the other states, at least until year ten, and after that the gap can be closed if we challenge our young people to dream big and stay at school to get the knowledge and skills they need to realise their dreams. Nothing is more important than education to our local communities’ health, economic competitiveness and resilience. Education is the most powerful, the most effective and in fact the only way to reverse a cycle of poor health, poverty, underemployment and disadvantage into an upward spiral of hope, jobs and achievement, for individuals, for communities, and indeed and for the State as a whole.